The answer to that question is usually complex and sometimes confusing. Hiring the right personal injury attorney who knows the ins-and-outs of pedestrian accidents can help you figure it out. In general, there are four primary ways a pedestrian who has been hit by a car can get their medical treatment paid for. If you’re hit by a driver in Washington State, they have a responsibility to pay your medical bills with Personal Injury Protection (PIP) coverage. PIP coverage is regardless of fault, meaning if your medical treatment is reasonable, necessary and accident related, PIP will cover it. If the driver who hit you doesn’t have PIP coverage – Washington State requires insurance companies to offer PIP coverage, and if you choose to reject it, it must be done so in writing – your own PIP coverage becomes primary. Again, if your medical treatment is reasonable, necessary and accident related, PIP will cover it. Even if you can use PIP insurance to cover your medical bills, you should still use your health insurance. The main disadvantage with health insurance is you are still required to pay copays and deductibles for your treatment, and are sometimes limited to in-network providers. If there is no PIP insurance or health insurance available, pedestrian accident victims can usually find a provider that will treat them on lien. This means there is a lien (claim) on the total settlement. Sometimes providers require a letter of protection – basically a guarantee – from an attorney that they will receive payment upon resolution of the case. While not the best option, this still allows for victims to receive treatment. 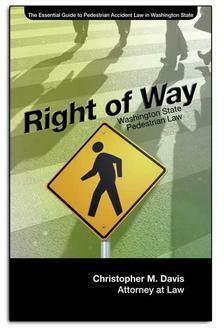 If you have been injured by a motor vehicle while crossing the street, walking on the sidewalk, or acting in any other pedestrian setting, it is important that you contact an experienced Washington State pedestrian accident attorney for assistance in filing a claim and seeking the compensation you deserve. The right pedestrian accident lawyer can help by compiling the evidence necessary and by negotiating with insurance to reach a proper settlement amount. To learn more or discuss your case, contact Davis Law Group and schedule a case evaluation. Call (206) 727-4000, use the chat feature below or fill out the contact form on this page today.